The research is clear and conclusive. Strong and consistent public opinion also reinforces the fact many of America's public schools fail to provide a fair and equitable education to all children, especially poor children, children of color, and girls. Gender equity is now on the national education reform radar screen. However, emerging research confirms growing achievement gaps by gender in areas such as technology, math, and the sciences. In an effort to mobilize parents and communities to address these critical issues, the Public Education Network (in partnership with local education funds) and the Metropolitan Life Foundation joined forces to generate public discussion about local efforts to increase student achievement through gender equity. This report summarizes the LEF experiences that were shared during PEN's 1998 Annual Conference, Public Education: Breaking the Cycle of Poverty. 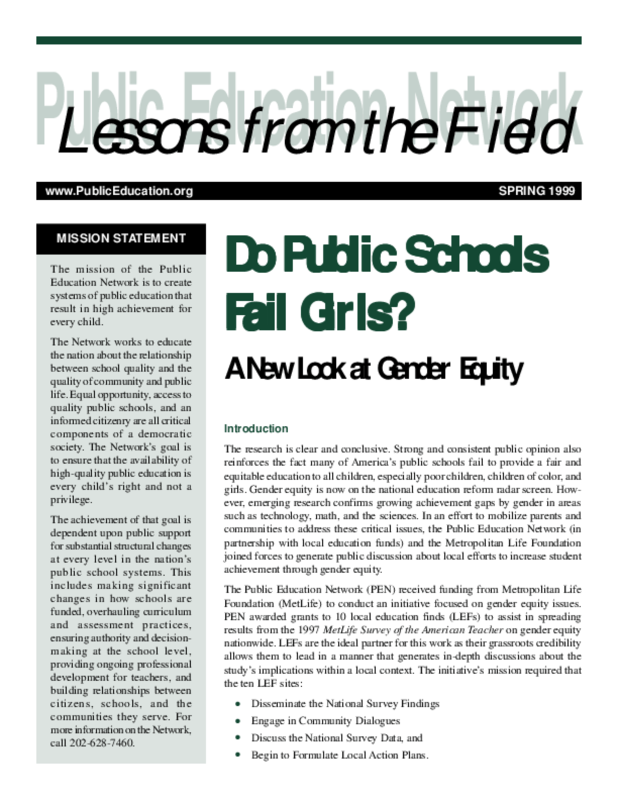 The findings reveal both the unique circumstances embedded in each site, as well as the community strategies undertaken in looking at gender equity in their public schools.